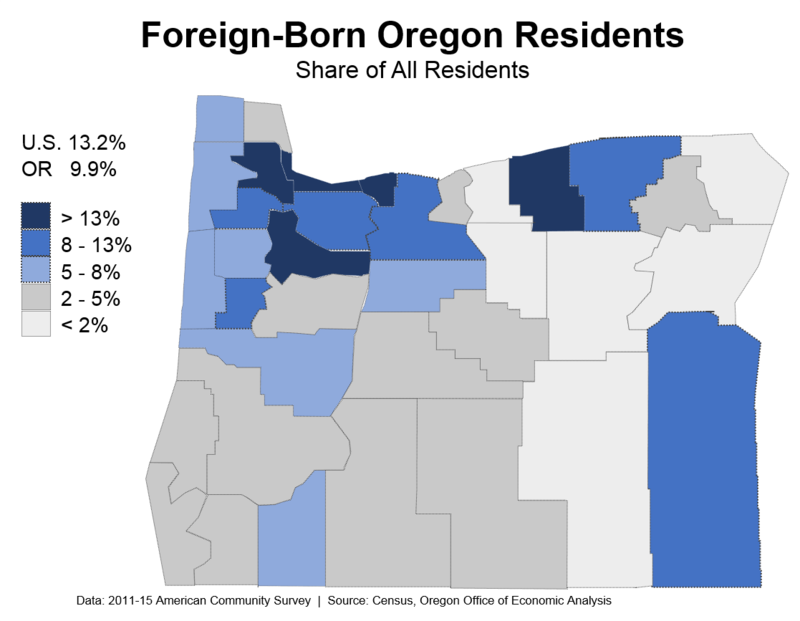 On the heels of the recent post on diversity and Middle Eastern ancestry, our office wanted to get a better understanding of the foreign-born population here in Oregon. So we asked Kanhaiya in our office, and Charles Rynerson, demographer at Portland State’s Population Research Center, to help us with some data and information. What follows is a look at the historical trends here in Oregon, which countries our foreign-born residents came from and the like. Thanks Kanhaiya and Charles! UPDATE: One reason this is important has to do with demography. Many foreign-born or minority households do have higher birth rates. Many of rural Oregon’s counties with a higher foreign-born or minority population share have better population outlooks as the natural increase (births minus deaths) remains positive. The natural increase has slowed considerably across the nation as the Baby Boomers age, and has turned negative in many parts of the country and in some areas here in Oregon. 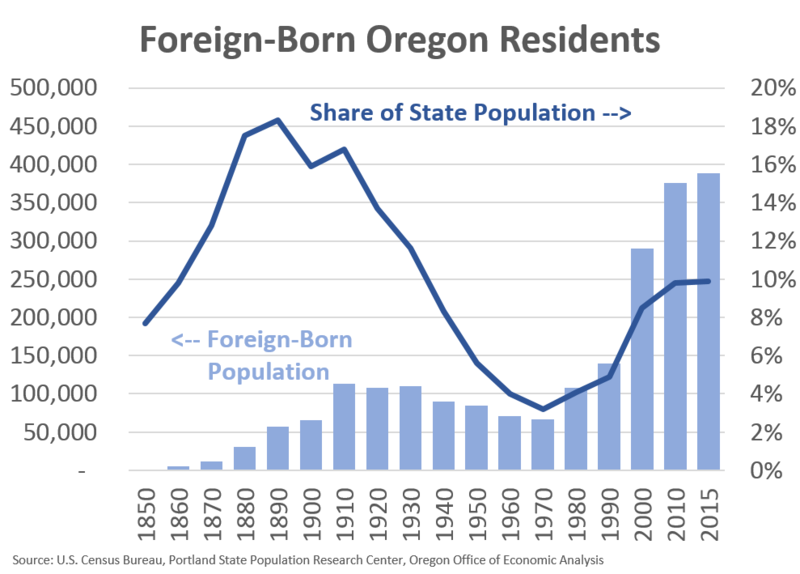 The first chart shows the foreign-born population here in Oregon going back more than 150 years. The distinct growth and outright decline periods are interesting to note over this time. Clearly a lot of history embedded in this chart. For more seen PSU’s website Road to 4 Million. Of the current foreign-born population, 40% were born in Mexico. This is by far the largest country of current foreign-born residents in Oregon and significantly larger than other regions of the world for that matter. 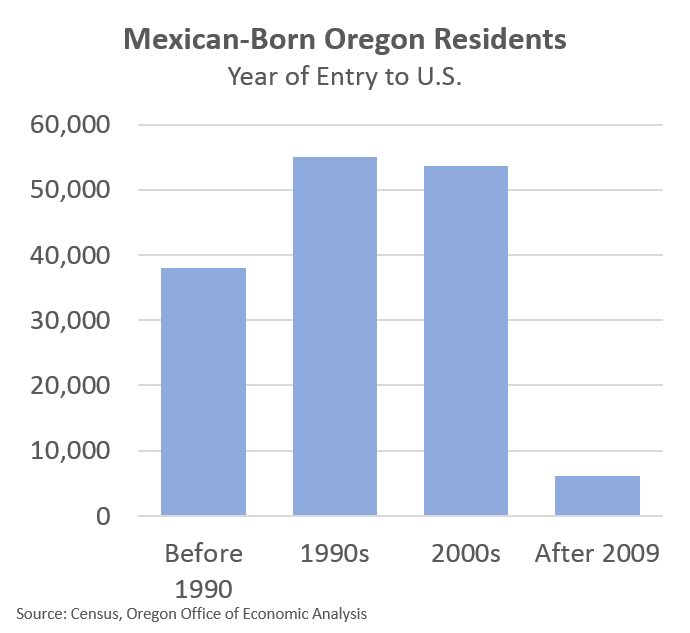 Now, what is interesting is that the vast majority of the Mexican-born Oregon residents came to the U.S. a decade or two ago. There has been very little international migration in recent years. There are two reasons for this. One has to do with Mexican demographics and the falling birth rate a generation or so ago, resulting in fewer potential immigrants today. The second has to do with the economy. The Mexican economy has actually performed pretty well in the last decade, while the U.S. has not. The economic incentives switched as the Great Recession wreaked havoc on the U.S. economy. Some national estimates, particularly of illegal residents, show population losses to Mexico in the years since the Great Recession and housing bust. That said, with the strong U.S. dollar and weak Mexican peso, some of these economic incentives are switching back. It will be interesting to see how this impacts international migration. The county map below shows where within Oregon has the highest and lowest shares of foreign-born residents. The darkest blue counties are significantly above the state average and above the U.S. average as well. 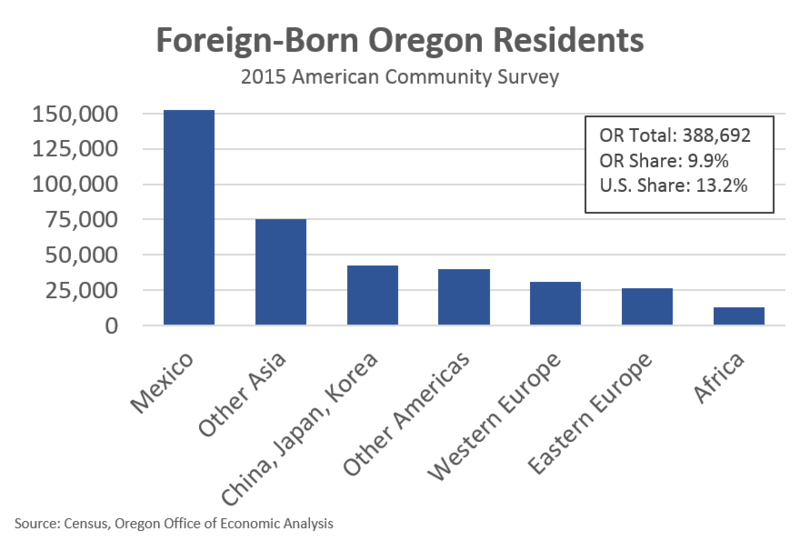 They account for about 40% of the Oregon population overall but 65% of the foreign-born population. The second darkest blue counties have a foreign-born share that is roughly equal to the statewide average. All other counties have significantly lower shares. Lastly, via the U.S. State Department (HT Charles) one can track the number of refugees coming to Oregon. 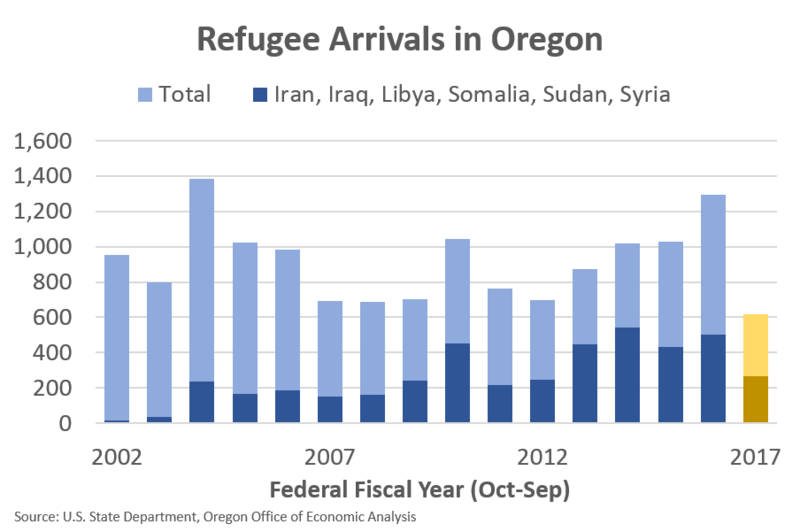 Over the past 15 years, Oregon has seen an average of about 1,000 refugees per year. In recent years about half of these refugees came from the seven countries that are explicitly listed in the executive order. Keep in mind that refugees have a specific definition — those who have been forced to leave their country due to violence or persecution — and the overall international migration flows tend to be larger. Within Oregon, 84% of these refugees in the past 15 years arrived in the City of Portland. 97% within the Portland MSA overall. As such, obviously very few throughout the rest of the state. For example, I was recently down in Eugene for a presentation and in looking at the data, Eugene and Springfield saw 13 refugees in the past 15 years. For more on the patterns within the Portland MSA I would direct you to contact Charles who has some cool maps looking at neighborhoods, where languages other than English are spoken in the home and the like. Thank you for this excellent and timely work on a very sensitive subject. Good work!